Strowman reacted to his disqualification from the highly anticipated universal title clash, he revealed that it’s a hard pill to swallow for him. World Wrestling Entertainment’s (WWE) Braun Strowman was due to face Brock Lesnar for the Universal title at the Royal Rumble pay-per-view event but now it will Finn Balor taking his place. Strowman has a reputation for being an aggressive person and that was on display in the previous episode of Monday night RAW. The ‘monster amongst men’ destroyed chairman Vince McMahon’s limousine and the repercussions ensued. The wrestler was fined of $100,000 and stripped off the opportunity to challenge Lesnar for the coveted title. 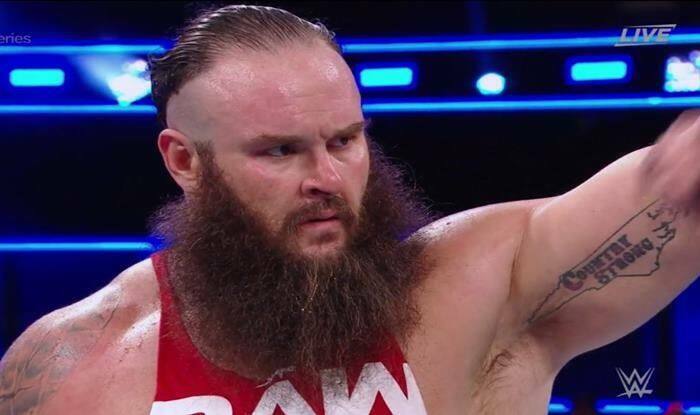 Speaking to app.com, Strowman reacted to his disqualification from the highly anticipated universal title clash, he revealed that it’s a hard pill to swallow for him. “It’s a pretty hard pill to swallow right here right now, but at the same time, I’m going to use it for fuel to the fire to continue to push the monster train along. Nothing’s going to stop me from reaching the top of this mountain,” he said. Fin Balor has emerged well amongst the ranks and he was thus given the chance while Strowman can gain more momentum over the time till Wrestlemania. In the episode of RAW, After Strowman’s disqualification, a match was scheduled to define the replace number one contender for the universal title match against Lesnar in which Balor emerged victoriously. He pinned John Cena in a fatal-four-way match against Corbin and Drew McIntyre to earn the opportunity for the title clash at Royal Rumble. Lesnar will now defend his title against Finn Balor at the Royal Rumble 2019 event on January 27th.